Airbnb is quietly expanding from sharing houses and apartments to parking. An Airbnb user in San Francisco is currently offering two parking spots in a gated lot at $7 per day per spot. Compare that to paying up to $24 per day at private lots. LAUNCH contacted Airbnb to confirm the expansion, but a spokesperson said the company did not have time to comment in light of the vandalism incident in San Francisco. 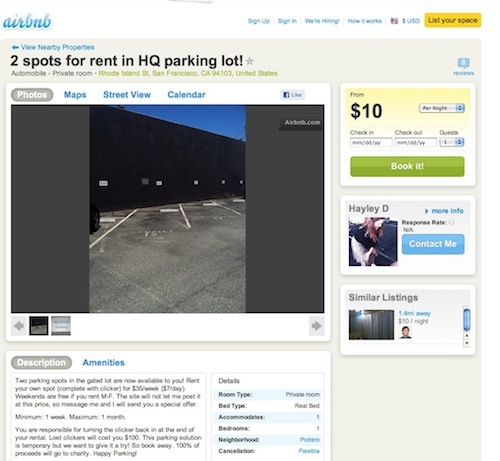 Renting parking spaces in cities makes sense, and Airbnb is not the first company to try it. Park Circa, a new San Francisco-based startup, lets drivers list, find and check in to parking spaces with its free iPhone and Android apps. Once a driver arrives at the listed spot, she clicks “check-in” to start the timer and legal contract with the owner of the space. Park Circa uses the honor system, but if a driver gets caught parked in a space without checking in, her car can be towed. In London, the smarter parking idea took hold in 2006 when the founders of ParkatmyHouse turned their frustration with parking in San Francisco into a business. BMW's venture arm recently invested. ParkatmyHouse has more than 125K registered drivers and claims to have saved drivers more than 3M pounds ($4.8M) in parking charges. Other London companies providing similar services are Park-Up, launched in 2007, and Parklet, launched in 2004.